How to Bridge the Flows between Parent and Sub-Diagrams? Current: How to Bridge the Flows between Parent and Sub-Diagrams? When modeling complex systems, we often use the sub-diagram to elaborate a particular elements in details. This helps to keep our design clean and context sensitive. However, in previous versions, sub-diagram didn't explain how the flows were associated between parent element and the child diagram. In Visual Paradigm, you can now display the in-flow and out-flow element in sub-diagram in certain situations, which helps you to identify the flows between diagrams. Once the sub-diagram is being created and the incoming and outgoing flow are pulled into the sub-diagram, you can then start modeling the sub-diagram from the incoming flow and end with the out-going flow. 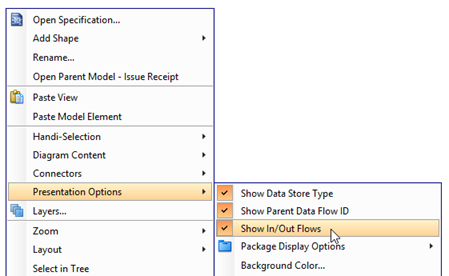 To turn on the in-flow and out-flow indicator, right click on the blank area of the diagram and select Presentation Options > Show In/Out Flows. 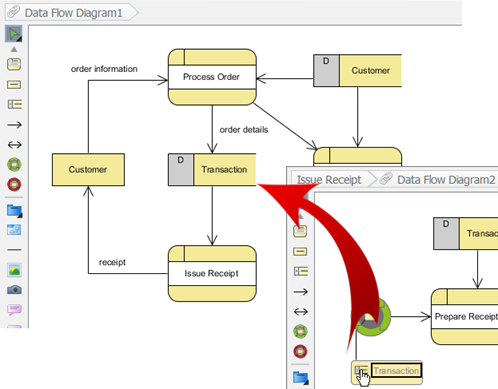 Once the In-flow and Out-flow indicator are shown, you can navigate to the parent diagram by double click on it.